You don't need a fancy espresso machine to make a great cup of coffee at home - just a cafetiere and some freshly ground beans. Many millions of words have been spilt on the subject of the perfect cup of coffee, the vast proportion confusing or downright contradictory. Here's a simple guide to good coffee at home. Let's be honest: good coffee depends heavily on equipment, which is why so many connoisseurs generally prefer to go out to a cafe with huge, shiny professional machines and baristas who have studied their craft in Milan and Melbourne, while their own over-complicated, underpowered espresso-makers gather dust in the kitchen. Espresso machines anyway, according to Victoria Moore in her superb How to Drink, are only good for making espressos, rather than the long lattes, flat whites and so on that many of us use them for, because - "coffee made in this way doesn't do much to showcase the bean itself". So, most British coffee drinkers can breathe a sigh of relief: Moore's preferred methods are rather less punishing on the wallet. Like Frank Bruni in the New York Times, she appreciates the "smoothness, freshness and balance" of the individual ceramic filter, which London coffee lovers may have observed in use at the Monmouth Coffee Company - although what attracts me to them is that they're easy to clean up. You just chuck the paper, coffee and all, into the bin. 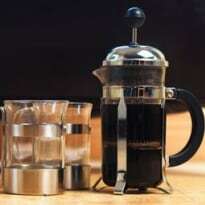 But, she says, the homely cafetiere, a device which I cannot imagine any Guardian reader is without, is also good for bringing out the flavour of your coffee beans. You just need to use it properly. The Grumpy Mule coffee company counsels using at least two rounded dessertspoons of coffee a person (there's nothing worse than wan, watery coffee), and fresh water (as opposed to stuff that has been sitting in the kettle for a few hours) that's just off the boil: the National Coffee Association of the USA recommends a temperature between 90-96C. I happen to have a kettle that, handily, can be set to cut off at 90C, but leaving it for at least 30 seconds after boiling will do the trick. Pour just enough water on to moisten the grounds, then allow them to absorb the water before filling the cafetiere. Allow to settle, then stir and add the plunger to keep it warm. Leave for four minutes (Victoria reckons 30 seconds is enough, because "coffee tastes sharper and brighter if it doesn't have much steeping time", but to my mind, the longer brewed coffee is richer), then stir, plunge and pour into warm cups. Most important, of course, is the coffee itself. It needs to be fresh (coffee only keeps for two weeks, stored in an airtight container in the fridge), and it's even better freshly ground, if you have got the equipment. Check sell-by dates when buying. Obviously you also need to find a coffee you like: they vary hugely in character according to variety, country of origin and roast, so it's worth experimenting. If you add milk, I'd say the temperature was up to you. Those who add a lot may wish to warm it gently first (hot milk will spoil the flavour of your coffee), but if you're prepared to drink fast, cold milk will do the trick too. And real purists may wish to add nothing at all - with coffee, perfect is very personal.